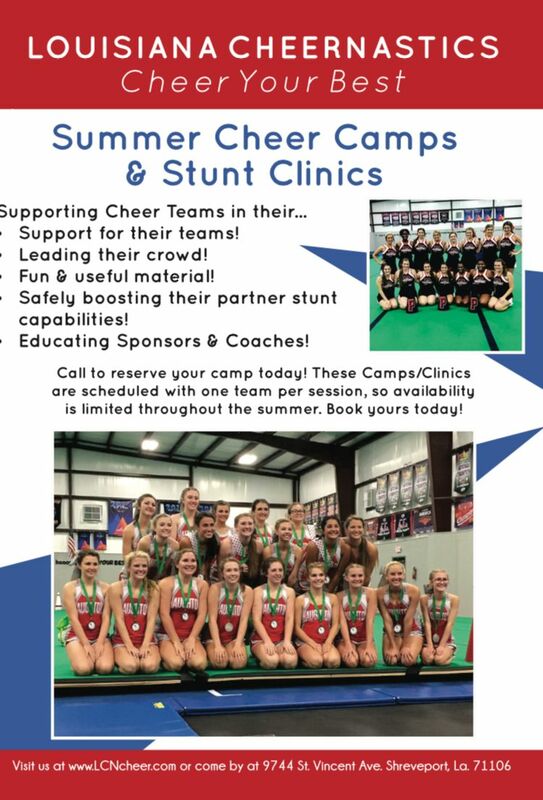 These fun and instructional camps are designed to get your cheer team ready to go back to school! Let us help your team grab your crowds attention with great stunts, crowd leading cheers and fun dance routines! Fun "Spirit Dance" with the incorporation of stunts in routine! Team Building games and activities!!! "One Day Cheer Camps" are available for cheer teams. These camps are $65 per athlete. These camps are open for scheduling on Thursday's and Friday's throughout the summer from 8:30am to 3pm. Let us help your team grab the attention of your crowd with their partner stunting! Through safe and proper progressions, our coaches will meet your team at their level and help them to go beyond! Skills Clinics... Ex. Back-Handspring Clinics. Back Tuck Clinics. Etc. Stunt Clinics... Help individuals with the three positions in partner stunting... Back Spotting, Basing and Flying.